Unfortunately, the ancient data from the Wang et al. preprint still haven't been released online. As I've already pointed out many times, the manuscript conclusion looks horribly contrived (for instance, see here), but the data are awesome, and most of the preprint is quite solid. 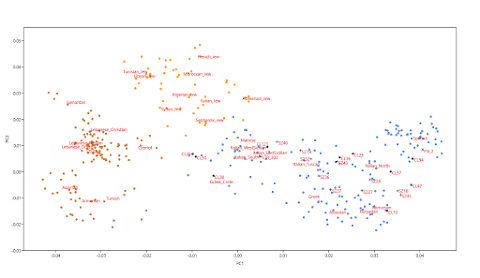 One thing that I'd really like to do is to compare in detail each of the ancient populations from the preprint to groups of present-day and ancient speakers of Indo-European and Caucasian languages. What's the bet that, by and large, Eneolithic steppe will show strong links to Indo-Europeans, while Eneolithic Caucasus and Maykop to Caucasians? But pending the release of the data, all I can do is look at what the authors have done with it. Intriguingly, their analyses suggest that the Eneolithic steppe genotype may have vanished from the steppes abutting the Caucasus by at least 3500 BC. It seems to have been replaced there by a more heterogeneous gene pool, with both more easterly and southerly genetic affinities, associated with the Steppe Maykop archeological culture. So who were the Steppe Maykop people and why did they show up, rather suddenly, in the North Caucasus steppes to seemingly clear out the Eneolithic steppe population from the region? I have a theory about that. Both archeological and ancient DNA data show that the North Caucasus was being colonized by groups from Transcaucasia during the Eneolithic. But apparently this wasn't an entirely smooth and safe process, because these southern settlers were forced to build elaborate fortifications to keep the natives at bay. Indeed, at the site of Meshoko, in the Northwest Caucasus, there is evidence of such a fort being overrun and its community replaced, probably by a nearby indigenous group (see here). On the other hand, during the Bronze Age Maykop period, the relations between the settlers from the south and the steppe peoples were apparently much more peaceful. So much so, in fact, that Maykop settlements weren't fortified. However, this was also the period when the North Caucasus steppes were home to the Steppe Maykop people. So here's my theory: either by chance or design, Steppe Maykop territory was a buffer zone between Maykop and the potentially aggressive natives of the steppes to the north. I'm not necessarily suggesting that the Steppe Maykop people were foreign mercenaries hired by Maykop chiefs, but, in any case, they may have benefited economically in a variety of ways by keeping Maykop settlements safe. Around 3000 BC, both Maykop and Steppe Maykop disappeared. The latter was replaced by the Yamnaya culture. I don't know much about this process. It may have been mostly driven by environmental impacts from climate change. But the fact that the Steppe Maykop population didn't contribute much, if any, ancestry to the Yamnaya people in the region suggests to me that it was a hostile takeover by Yamnaya. Interestingly, the spread of Yamnaya into the North Caucasus steppes saw the return of the Eneolithic steppe genotype to the region, albeit in a modified form, with admixture from Middle Neolithic European farmers (see here). Over at bioRxiv at this LINK. Below is the abstract, emphasis is mine. Two of the (unrelated) males from Yana RHS belong to Y-haplogroup P1 and mitochondrial haplogroup U2. Note that P1 is ancestral to Y-haplogroups Q and R.
Far northeastern Siberia has been occupied by humans for more than 40 thousand years. Yet, owing to a scarcity of early archaeological sites and human remains, its population history and relationship to ancient and modern populations across Eurasia and the Americas are poorly understood. Here, we report 34 ancient genome sequences, including two from fragmented milk teeth found at the ~31.6 thousand-year-old (kya) Yana RHS site, the earliest and northernmost Pleistocene human remains found. 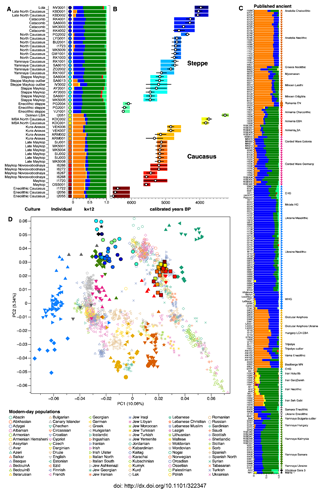 These genomes reveal complex patterns of past population admixture and replacement events throughout northeastern Siberia, with evidence for at least three large-scale human migrations into the region. 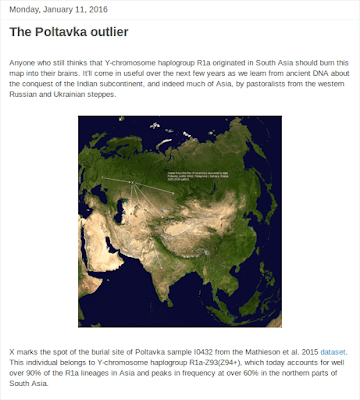 The first inhabitants, a previously unknown population of "Ancient North Siberians" (ANS), represented by Yana RHS, diverged ~38 kya from Western Eurasians, soon after the latter split from East Asians. Between 20 and 11 kya, the ANS population was largely replaced by peoples with ancestry from East Asia, giving rise to ancestral Native Americans and "Ancient Paleosiberians" (AP), represented by a 9.8 kya skeleton from Kolyma River. AP are closely related to the Siberian ancestors of Native Americans, and ancestral to contemporary communities such as Koryaks and Itelmen. Paleoclimatic modelling shows evidence for a refuge during the last glacial maximum (LGM) in southeastern Beringia, suggesting Beringia as a possible location for the admixture forming both ancestral Native Americans and AP. Between 11 and 4 kya, AP were in turn largely replaced by another group of peoples with ancestry from East Asia, the "Neosiberians" from which many contemporary Siberians derive. We detect additional gene flow events in both directions across the Bering Strait during this time, influencing the genetic composition of Inuit, as well as Na Dene-speaking Northern Native Americans, whose Siberian-related ancestry components is closely related to AP. Our analyses reveal that the population history of northeastern Siberia was highly dynamic, starting in the Late Pleistocene and continuing well into the Late Holocene. The pattern observed in northeastern Siberia, with earlier, once widespread populations being replaced by distinct peoples, seems to have taken place across northern Eurasia, as far west as Scandinavia. Not sure if anyone's mentioned or noticed this already, but the two currently available genomes from Hellenistic Anatolia (samples MA2197 and MA2198 from Damgaard et al. 2018) pack an impressive amount of steppe ancestry. Moreover, one of these individuals also shows obvious admixture from Central Asia. Hence, MA2197 can be modeled very successfully with more than 50% ancestry from a source closely related to the Bell Beakers from the Carpathian Basin and the presumably Celtic-speaking Hallstatt population of what is now Czechia. This almost certainly proves to me that MA2197 is largely of Galatian Celtic stock. The models for MA2198 aren't quite as statistically sound, but they still work, and indeed suggest that this individual might be in large part of Cimmerian origin. The American Society of Human Genetics (ASHG) annual meetings kicks off tomorrow in San Diego. Feel free to post anything near and far related to this event in the comment thread below. You can explore this year's offerings via the online planner/abstract search located HERE. See anything really interesting? Here's what I found after a quick search using the term "ancient". Hopefully someone tweets from the South Asian talk. In addition, we found steppe-like ancestry in the Roman Period individuals which we have previously detected in present-day Lebanese but not in Bronze Age individuals. This supports our previous proposition that the steppe ancestry penetrated the region more than 2,000 years ago, and genetic continuity in Lebanon is substantial. So what are we dealing with here exactly: admixture from the Hittites, Mittani, and/or Romans? Who does the Global25 point to? Over the years some scientists from the Estonian Biocentre have been among the staunchest opponents of the idea that Bronze Age pastoralists originating in the steppes of Eastern Europe had a significant genetic and linguistic impact on South Asia (for instance, see here). But this week they put out a review paper titled The genetic makings of South Asia [LINK] featuring the figure below. It's a nice visualization of the current state of understanding of the peopling of South Asia, and does acknowledge the major role that the said steppe pastoralists had in this process. However, there's not a single mention of Y-haplogroup R1a in the review. This is surprising, considering the once common, but now no longer valid, claims that this paternal marker may have originated in India. I guess the grieving process will continue for a little longer for some. My long-held opinion about the claims that R1a was native to India, Iran, Central Asia, or, indeed, anywhere but its actual homeland, which is certainly Eastern Europe, can be summarized as such: LOL! 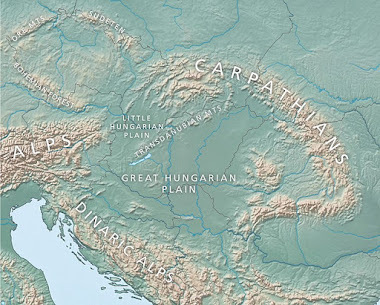 For millennia, the Pontic-Caspian steppe was a connector between the Eurasian steppe and Europe. In this scene, multidirectional and sequential movements of different populations may have occurred, including those of the Eurasian steppe nomads. We sequenced 35 genomes (low to medium coverage) of Bronze Age individuals (Srubnaya-Alakulskaya) and Iron Age nomads (Cimmerians, Scythians, and Sarmatians) that represent four distinct cultural entities corresponding to the chronological sequence of cultural complexes in the region. Our results suggest that, despite genetic links among these peoples, no group can be considered a direct ancestor of the subsequent group. The nomadic populations were heterogeneous and carried genetic affinities with populations from several other regions including the Far East and the southern Urals. We found evidence of a stable shared genetic signature, making the eastern Pontic-Caspian steppe a likely source of western nomadic groups. Update 04/10/2018: Twenty four of the ancient nomad samples made it into the Global25 datasheets. Look for the following population codes: Cimmerian_Moldova, Sarmatian_Urals, Scythian_Moldova, Scythian_Ukraine and Srubnaya-Alakulskaya_MLBA. Feel free to put them through their paces and share the results with us in the comments below. I designed a new Principal Component Analysis (PCA) to help me test the fine scale genetic affinities of post-Bronze Age ancient samples from Southern Europe and surrounds. Below is a version of this PCA with a selection of the most Southern European-related ancients from this year's Amorim et al. and Veeramah et al. papers (for background reading, see the posts and comments here and here). The relevant datasheet is available here. A number of people in the comments at this blog and elsewhere were especially curious about the potential genetic origins of the three most Near Eastern-shifted individuals from the Amorim et al. dataset: CL25, CL30 and CL38. Judging from my new PCA, it seems likely to me that this trio came to North Italy from the pre-Slavic invasions Aegean region. In other words, I'd say they're probably Roman era Greeks or their descendants, who, unlike most present-day Greeks, don't harbor any Slavic ancestry. That's because they cluster very strongly with present-day Greeks from Crete, and also more or less sit on a cline running from present-day mainland Greeks to Cypriots.